#MarineNotice - Marine Notice No 14 of 2018 advises that as part of the Donegal Group B Sewerage Scheme, remedial works are being carried out this week by Norfolk Marine at the Bundoran outfall in Donegal Bay. These works were scheduled to begin on Tuesday 3 April to last for around one week at 54° 28.778’ N and 08° 19.304’ W, conducted from the vessel Chateau Thierry (Callsign EI-HK-6). 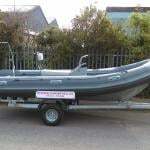 An additional small boat or RIB will also be involved in the operation as required. The work vessel will display appropriate lights and markers, and will monitor VHF Channel 16 throughout the project. Marine Notice No 12 of 2018 advises that the Marine Institute was scheduled to deploy a bottom-mounted acoustic Doppler current profiler (ADCP) on the Aran prawn ground today, Monday 26 March. The ADCP will be recovered in May and will remain in place for the duration. The purpose of this deployment is to measure water current speed over a depth range using the Doppler effect of sound waves scattered from particles within the water column. 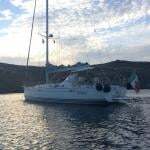 The ADCP was set to be deployed at Latitude 53°46.133 N and Longitude 9°47.4 W by the RV Celtic Voyager (Callsign EIQN) listening on VHF Channel 16. As this is sensitive scientific equipment, it is requested that fishermen and marine operators engaged in such activities as bottom trawling or laying of static gear avoid the location concerned to avoid damaging the equipment or damaging fishing gear. The Irish Maritime Administration at the Department of Transport, Tourism and Sport has issued a Marine Notice to remind the public of the law in relation to being under the influence of alcohol and / or drugs when operating or while on board a recreational craft or any vessel in Irish waters, or on board vessels or objects being towed by recreational craft. The recently published Annual Report of the Marine Casualty Investigation Board (MCIB) highlights the fact that alcohol or drug consumption continues to be a factor in marine incidents, including incidents involving recreational craft. Successive MCIB Annual Reports have shown that incidents are occurring where diminished human performance and impairment due to the effects of alcohol and / or drug consumption have been primary causes or contributing factors, leading to the loss of life in some cases. In the recent Annual Report, the MCIB Board reminds all vessel operators of the need to take personal responsibility and to ensure that they are fit to undertake their planned voyage. • YOU must take personal responsibility for your actions on the water. • YOU must avoid alcohol and drugs before or during a voyage. • If you fail to operate safely and to comply with the law in relation to alcohol and drug consumption YOU put your life and your vessel at risk as well as the lives of others, including members of the rescue services. 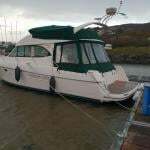 • It is against the law to consume alcohol and drugs in circumstances that could affect the safety of others on board or others using Irish waters, or create a disturbance on board or be a nuisance to others using Irish waters. • Alcohol speeds up the rate of body cooling and thus increases the risk of hypothermia in the event that you fall into the water. 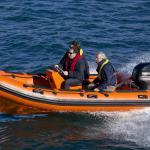 Regulations 8 and 9 of the Pleasure Craft (Personal Flotation Devices and Operation) (Safety) Regulations 2005 [S.I. No. 921 of 2005], as amended, set out the law regarding the consumption of alcohol or drugs while on board a pleasure craft, including prohibitions on operating a pleasure craft while under the influence. Failure to comply with the law can result in a fixed payment of €150 and/or prosecution proceedings which, on summary conviction, can lead to a fine of up to €5,000. A pleasure craft includes personal watercraft, such as jet skis, and fast power craft. 1. A person in command or in charge or another member of the crew of a vessel in Irish waters (or an Irish ship in waters anywhere) must not operate or control or attempt to operate or control the vessel or carry out any task or duty in relation to the operation or control of the vessel while he or she is under the influence of alcohol or a drug or any combination of drugs, or drugs and alcohol to such an extent as to be incapable of properly controlling or operating the vessel or carrying out the task or duty (section 28). 2. A person on board a vessel in Irish waters (or an Irish ship in waters anywhere) must not consume alcohol or take a drug or any combination of drugs or drugs and alcohol while on board the vessel in circumstances which could affect the safety of persons or create a disturbance or serious nuisance on board the vessel or affect the safety of other persons using Irish waters or constitute a nuisance to such persons (section 30). 3. Failure to comply with the above requirements is an offence and the person is liable on summary conviction to a fine not exceeding €5,000 or to imprisonment for a term not exceeding 3 months or both. 4. If a person in command or in charge or another member of the crew of a vessel is, while on duty, under the influence of alcohol or a drug or any combination of drugs or drugs and alcohol to such an extent that his or her ability to discharge his or her duties is impaired, he or she commits an offence and is liable on summary conviction to a fine not exceeding €5,000 (section 29). 5. A person on board a vessel in Irish waters (or on an Irish ship in waters anywhere) who through any deliberate or reckless action or by reason of being under the influence of alcohol or a drug or any combination of drugs or drugs and alcohol puts at risk or endangers the safety, security or seaworthiness of the vessel or the lives or safety of persons on board commits an offence and is liable on summary conviction to a fine not exceeding €5,000 or to imprisonment for a term not exceeding 6 months or both, or on conviction on indictment, to a fine not exceeding €100,000 or to imprisonment for a term not exceeding 2 years or both (section 32). #MarineNotice - Fugro is currently carrying out marine operations for the HAVFRUE Subsea Cable System Project, further to its work carried out in January. The current survey within Irish territorial waters off the North West Coast began on Wednesday 14 March and is expected to run till midweek next week. The MV Fugro Discovery (Callsign 3EKE6) is surveying on Segment 2 within Irish EEZ waters towards the 1,500m contour line at the shelf, followed by operations at the BU1 position and Segment 3 as indicated on the charts included with Marine Notice No 10 of 2018, a PDF of which is available to read or download HERE. #Ports&Shipping - The Department of Transport, Tourism and Sport (DTTAS) has issued an advisory to the maritime sector to make cybersecurity an integral part of their risk assessment exercises and continuity plans. At the Maritime Safety Committee (MSC) of the International Maritime Organization (IMO) in 2017, measures were agreed in relation to the cyber risk being taken into account by shipping companies in respect of the International Safety Management Code. Resolution MSC 428(98) calls for cyber risks to be appropriately addressed in safety management systems no later than the first annual verification of the company's Document of Compliance after 1 January 2021. The IMO has also published guidelines on cybersecurity for the industry, included in Marine Notice No 08 of 2018, a PDF of which is available to read or download HERE. In relation to ports, the approach that the DTTAS is planning to take in Ireland is to incorporate a cybersecurity risk element in the security assessments which are carried out in accordance with Regulation (EC) No 725/2004 1 and Directive 2005/65/EC 2 in our ports and port facilities. The next five-yearly renewal of these assessments is due in all Irish ports by 30 June 2019. #Cruising - The Department of Transport, Tourism and Sport (DTTAS) wishes to draw attention to the fact that some European Union member states require the operators of pleasure craft operating within their territorial waters to hold an International Certificate for Operators of Pleasure Craft (ICC). Irish Sailing, which supersedes Marine Notice No 12 of 2011, Resolution No. 40 (as amended by Resolution No. 71) of the Inland Transport Committee of the United Nations Economic Commission for Europe (UNECE) outlines the requirements for the issue of the ICC. Resolution No. 40 also lists the countries that have notified the UNECE Secretariat that they have accepted the Resolution. An ICC issued by a government that has accepted Resolution No. 40 indicates that the ICC holder has demonstrated the level of competence required by Resolution No. 40 for the ICC to be issued. Irish Sailing is appointed as an approved body to issue the ICC on behalf of the DTTAS. Persons requiring an ICC should contact Irish Sailing. #IAMS2018 - The annual Irish Anglerfish and Megrim Survey for 2018 (IAMS 2018) will be carried out between Monday 19 February and Monday 19 March off the West, Southwest and South Coasts of Ireland, in fulfilment of Ireland’s Common Fisheries Policy (CFP) obligations. The IAMS is a demersal trawl and beam trawl survey consisting of approximately 85 otter trawls (60 minutes) and 25 beam trawls (30 minutes) in International Council for Exploration of the Sea (ICES) area 7b, 7c, 7g, 7h, 7j and 7k. Fishing in 2018 will take place within a 3 nautical mile (nmi) radius of these indicative positions. The survey will be conducted by the RV Celtic Explorer (Callsign EIGB), which will display all appropriate lights and signals and will also be listening on VHF Channel 16 for CE18004. The vessel will be towing a Jackson demersal trawl or two four metre wide beam trawls during operations. The Marine Institute requests that commercial fishing and other marine operators to keep a 3nmi area around the tow points clear of any gear or apparatus during the survey period. While there is no statutory provision for the loss of gear at sea, the Marine Institute will make every effort to avoid gear adequately marked, according to legislation, that may be encountered in the notified areas. In the event that an operator has static gear or other obstructions within 3nmi of the listed points, it is the responsibility of the owner to notify the survey managers or vessel directly. This should be communicated by identifying specifically which ‘station’ is of concern using the appendix and contact details provided in Marine Notice No 03 of 2018, a PDF of which is available to read or download HERE. #MarineNotice - Fugro will be carrying out marine operations on behalf of TE Subsea Communications LLC for the HAVFRUE Subsea Cable System Project from this weekend. The survey project is scheduled to begin on Saturday 20 January and last for around 14 days, weather permitting, as conducted by the MV Fugro Discovery (Callsign 3EKE6). Survey operations will be conducted on a 24-hour basis. Throughout, the vessel will be displaying the shapes and lights prescribed in the International Rules for the Prevention of Collisions at Sea (COLREGS) Rule 27, to indicate that the survey vessel is restricted in its ability to manoeuvre. A listening watch will be maintained on VHF Channel 16, and the vessel will actively transmit an AIS signal. The survey comprises a dynamic programme to be conducted in several stages. The survey vessel will be deployed within the working area at times and positions determined by client requirements, weather and sea conditions. Co-ordinates of the survey area are included in Marine Notice No 02 of 2018, a PDF of which is available to read or download HERE. Please note that the survey within Irish territorial waters as indicated is not part of this notice and will be undertaken at a later date under separate notification.